Desserts, as opposed to healthful, naturally sweetened snacks, aren’t a regular thing around here. My family never got used to dessert after dinner. We didn’t do it when I was growing up, so it didn’t happen when I had my own family. If someone wants something sweet after dinner, there’s always fresh fruit, dried fruit and, more recently, freeze-dried fruit. There are enough sweet foods like muffins and Bliss Balls happening throughout the day, not to mention a few chocolate chips in pancakes, chia pudding for snack, or a handful of granola on top of oatmeal. My kids and I are all pretty sensitive to refined sugar, so desserts aren’t an ideal thing to serve when homework and deadlines are happening. I do like to make something special for Valentine’s Day though, even if it falls on a weeknight. My husband asks me every year if I’d like to go out for Valentine’s Day and I always say, “no, thank you.” I would much rather stay at home with my kids than in a crowded, over-priced restaurant. I don’t mind making a little extra effort for a special evening, whether it’s with chicken pot pie and flourless chocolate cake or cutting vegetables into heart shapes for soup or salad. My husband and son love red velevet anything, but I do not under any circumstances do artificial food coloring. I don’t think I need to explain why. 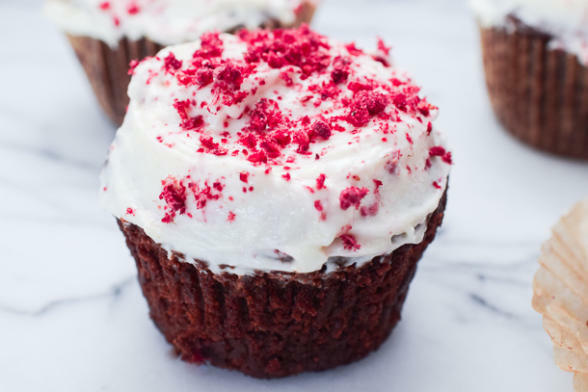 I came across this recipe for Vegan Red Velvet Cupcakes in my friend Candace Nelson’s book, “The Sprinkles Baking Book” and I was intrigued. Everything Candace makes is off the charts delicious, but not exactly health food (I still love you, Candace!) I noticed that the ingredients for these cupcakes were fairly in line with what I might use…..except the food coloring. 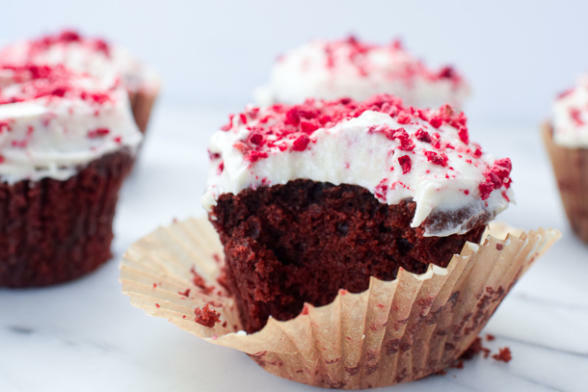 This is such a great basic cupcake recipe, I have a feeling you’ll be making these on more than just Valentine’s Day! I love seeing your creations, so keep tagging me on Instagram! @pamelasalzman #pamelasalzman. Below are the tools I used for this recipe. If you click on the images you can shop them too! All ingredients should be room temp so the coconut oil doesn't seize up. 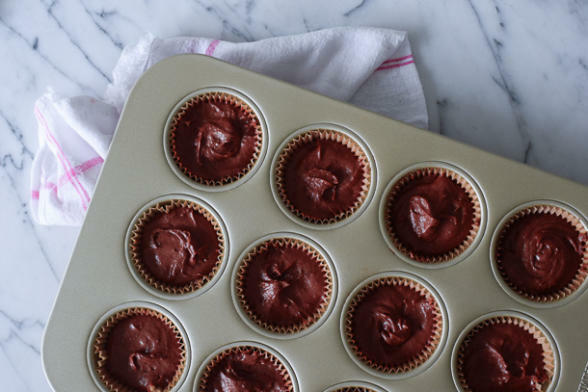 Preheat the oven to 350 degrees F and line a 12-cup cupcake pan with paper liners. 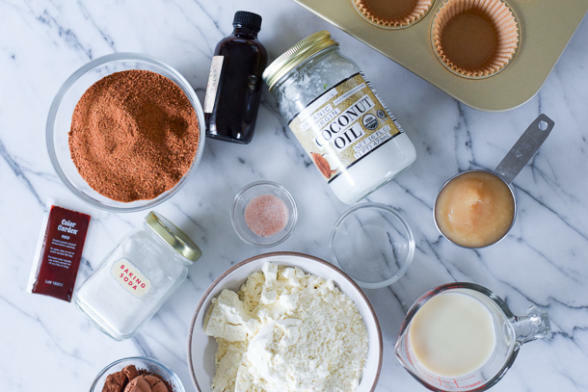 In a medium bowl, whisk together the flour, cocoa powder, baking soda and sea salt. In a small bowl, stir together the oat milk, vinegar, vanilla and food coloring. In the bowl of a stand mixer fitted with a paddle attachment, beat the coconut oil and coconut palm sugar on medium high speed until light and fluffy, about 2 to 3 minutes. Reduce the speed to medium-low and add the applesauce and beat until creamy, about 1 to 2 minutes. Slowly add half the flour mixture, then the oat milk mixture, then the remaining flour mixture, beating until just blended after each addition. Divide the batter evenly among the liners, and bake until the tops are just dry to the touch, and a toothpick inserted into the center comes out clean, 18-20 minutes. Vegan cream cheese frosting recipe: whisk together 16 oz vegan cream cheese at room temperature, I used Kite Hill plain almond milk cream cheese + 6 Tablespoons pure maple syrup + 1 teaspoon vanilla extract until smooth. 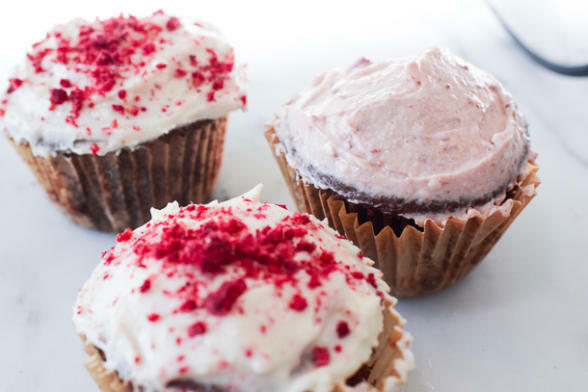 * You can also blend the freeze-dried raspberries and or strawberries with the vegan cream cheese to create an all pink frosting! do you think substituting beet powder for the coloring would change the texture? thank you. I do not think it will change the texture, but I cannot say for sure since I’ve never tried it. How much beet powder would be using? Just enough beet powder to give it the red color so I am hoping that would not take a lot. Seems like it would not change the texture. I can’t speak to the flavor though. I have used beet juice in baked goods and the flavor comes through a bit. I have a feeling powder would be less beet-y. Will this recipe work with gluten free flour? Any suggestions? Thanks! I haven’t tested this recipe with GF flour, but I have had a lot of success using Jovial Foods gluten-free pastry flour one for one with regular flour and I add a little extra xanthan gum. Another good GF flour is King Arthur Multi-purpose GF flour. Let me know if you try it.